Littlest Pet Shop: Strike a Pose! on DVD June 3rd! 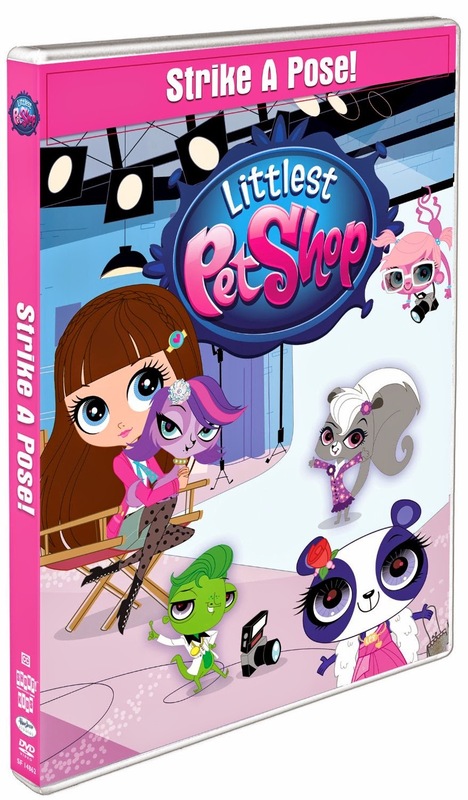 I've written previously about the Littlest Pet Shop: Lights, Camera, Fashion DVD, and the Littlest Pet Shop: Petacular Escapades on DVD! Littlest Pet Shop is just one of the tv shows that my daughter--and all of her four brothers--will watch and enjoy. I credit this to the show's humour, adorability factor, and bright colours. There's just something mesmerizing about the Littlest Pet Shop creatures' gigantic eyes! Now, Littlest Pet Shop: Strike a Pose! is coming to DVD on June 3rd, 2014--and I'm betting that your daughter or granddaughter would love to own it! Blythe Baxter and her dad moved into an apartment about the Littlest Pet Shop, so imagine her surprise when she realized she could talk to the pets--and they can talk back to her! The Littlest Pet Shop: Strike a Pose! DVD features five fun-filled episodes starring Blythe and her best friends! Join her and Zoe the spaniel, Pepper the skunk, Vinnie the gecko, Penny the panda, Sunil the mongoose, Minka the monkey, and Russell the hedgehog as Sunil becomes an internet sensation, the friends film a TV commercial, the Pet Shop welcomes a young alligator, and Vinnie makes friends with dancing lizards! The DVD showcases all-new original music by Daytime Emmy Award nominee Daniel Ingram, so get ready to get ready to sing and dance! So You Skink You Can Dance? WIN 1 of 2 Littlest Pet Shop: Strike a Pose! DVDs from SnyMed.com. Contest open to Canada & USA, and ends on Monday June 23rd, 2014. How to Enter: Leave a COMMENT below stating who you (or your child/grandchild) would rather have over at a party: Zoe the spaniel, Pepper the skunk, Vinnie the gecko, Penny the panda, Sunil the mongoose, Minka the monkey, or and Russell the hedgehog! Then use the entry form, below, to enter the contest. GOOD LUCK! My daughter loves zoe but i love sunil! I think my niece would have Zoe the spaniel at her party. We'd love to have Penny the Panda...so cute! I think Penny the Panda is one of the ones they like. We really like Zoe the most. Choose one??? She would have the hardest time with that.. she absolutely LOVES LPS. I am guessing it would have to be Minka the monkey though.